In mid-June, a congressional subcommittee singled out MIT's Industrial Liason Program as a technology transfer operation which was selling the results of federally-financed research to foreign firms. At a hearing on June 13, Rep. Theodore S. Weiss (D-NY), chairman of the Human Resources and Intergovernmental Relations subcommittee, asserted that though MIT's ILP is open to both US and foreign companies, the foreign firms --particularly the Japanese -- are its biggest users. MIT President Paul E. Gray '54 heralded foreign participation in ILP, praising the program as one of the first attempts by a university to link research and commercial applications. He claimed programs like ILP were crucial to education and research at American universities eager to learn about foreign research and corporate practices. Both men's remarks were made during an ongoing congressional investigation of universities, the National Institutes of Health, and the National Science Foundation. The subcommittee investigated possible conflicts of interest in the relationship between universities and industry. Of particular concern was MIT's exchange of research and technology with foreign companies. Officials at MIT and other universities have argued that technology transfer programs like ILP are needed to improve the productivity and competitiveness of American industry. Gray said that Weiss' assessment of high foreign participation in ILP -- the largest program of its kind in the nation -- was flawed because American companies that do not belong to the program are free to contact MIT faculty members about their research. Gray argued that the results of all MIT research are in the public domain. "The ILP does not provide exclusive access, privileged access or private access to those results," he said. "it does provide facilitated access." The 287 corporations participating in the program include 170 American and 57 Japanese firms. Each pays between $10,000 and over $100,000 per year for access to MIT research in its areas of interest. Company executives may visit MIT, and participating faculty members may visit company offices. Executives may also receive copies of research published by MIT faculty members and "preprints," copies of papers that have not yet been published. Faculty participation is voluntary, but those who join receive points, worth $35 each, for the work they do. A phone conversation with a company representative, for example, is worth 2 points. The points may be redeemed for office furniture, computer equipment, or professional travel. The average amount received by faculty members participating in the program last year was $665; the average among the 100 faculty members with the highest point totals was $3600. Weiss said that ILP records show that of 25 MIT faculty members who received more than $1 million in federal grants in recent years, 80 percent "had more contacts with foreign corporations than American ones." Weiss recalled that Gray had repeatedly called both for greater federal funding of research and for stronger business-university ties as ways to help US competitiveness, and he maintained that the establishment of an ILP office in Tokyo proved that the program was working against that goal. "Are you at all concerned that American taxpayers are paying for research whose results are being sold to (Japanese) industries that will not necessarily benefit the American public?" Weiss asked Gray. Gray said he was not concerned, and explained that the Tokyo office had been set up not to solicit Japanese firms, but for the convenience of MIT faculty members visiting Japanese member corporations. "If your concern is the extent to which federally-funded research is exploited by other countries, you shouldn't focus on ILP or programs like it at other universities," Gray told the subcommittee. "You'd have to change the whole context in which university research and graduate education take place and put it under wraps." One of MIT's fiercest critics with regard to corporate ties is David F. Noble, a former associate professor at MIT who was denied tenure in 1984. Noble claims that the position he took against MIT's ties to the Whitehead Institute for Biomedical Research influenced his tenure review. Noble filed a suit against MIT concerning his tenure decision in 1986. The ongoing court battle -- which has yet to go to trial -- has attracted further publicity to the issues which he and the Weiss subcommittee have raised. MIT, Noble argues, has been selling its base of knowledge and its research capabilities to the private interests sponsoring the Whitehead Institute. MIT's resources, he said, were a result of decades of public funding. Since they were bought with taxpayers' dollars, the resources were not MIT's to sell, he argued. Development of the institute at MIT was proposed in 1981 by millionaire industrialist Edwin Whitehead. Duke University had previously rejected a similar proposal from Whitehead after three years of negotiation. Duke claimed that the relationship between the university and the proposed institute would be of little benefit to the university, while providing Whitehead with valuable access to Duke's personnel and facilities. In a 1986 book, Biotechnology: The University-Industrial Complex Whitehead would provide direction to MIT's biomedical research by appointing 20 MIT biology department members and would own all inventions and intellectual property produced by those members. In return, MIT received a $7.5 million endowment as well as $5 million annually until 2003, and $100 million upon the death of Edwin Whitehead. As the proposal circulated, many MIT faculty members were critical. But while others complained that the partnership was simply a bad deal, Noble's argument against the institute was far broader: the partnership was a serious violation of the public trust. Noble summarized his argument in the Feb. 6, 1982, edition of The Nation Despite the controversy, MIT agreed to the Whitehead partnership in February 1982. When a court ruling is finally passed on the Noble tenure case, the issues on which he and MIT disagreed will remain unresolved. But Noble hopes that his case will send a strong message to students and other professors to "fight back -- to uphold the principles that historically universities have expressed -- freedom of inquiry and diversity of expression." Copyright 1990 by The Tech. All rights reserved. 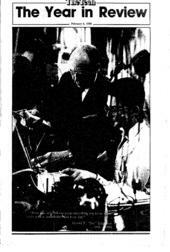 This story was originally published on Tuesday, February 6, 1990. The story was printed on page 5.